Lock in a great price for Ilima Hotel – rated 8.3 by recent guests! Walking distance to the beach, and very friendly staff. The room we got had a great view (even if only of surrounding buildings), great windows and a balcony. It's a block to the International Market, and about three to the beach. Best deal for a location! The stuff was outstanding! The location in Waikiki is nice, the parking lot is a plus. The staff was friendly and nice. We really enjoyed the complementary sing-along Christmas songs on Fridays during the month of December. Excellent location and free parking! From our ocean-facing balcony, we could see the Friday night fireworks, a very pleasant surprise. A full service supermarket and a food truck park within a few blocks gave us many local options for eating. A spacious room with a good range of furniture. The bed was very comfortable. The cleaning of the room was always done well. The staff are excellent and helpful. Location was great with an easy walk to the beach. Very friendly and professional staff. A great central location. Good bed and linen. Very good cleaning of the room and bathroom. The location is as good as the price can offer! Very near the mall and the beach. The most cheering thing—— free park! And the staff are very very nice! 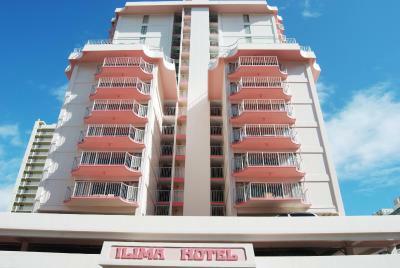 Ilima Hotel This rating is a reflection of how the property compares to the industry standard when it comes to price, facilities and services available. It's based on a self-evaluation by the property. Use this rating to help choose your stay! 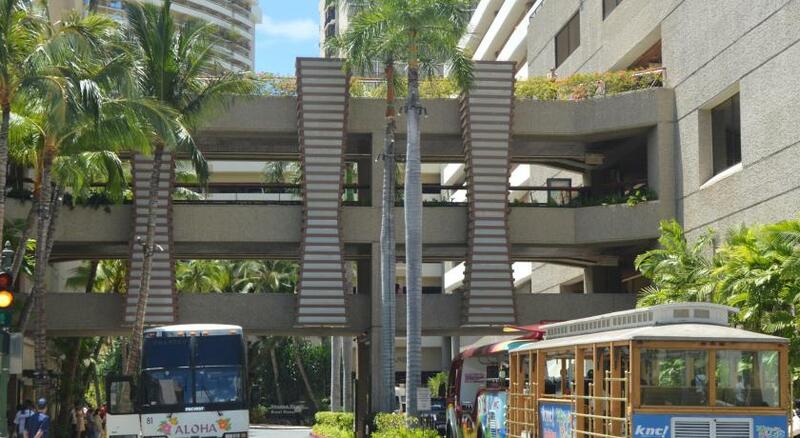 Centrally located near shopping and dining, the Ilima Hotel is only 2 blocks from Waikiki Beach. It offers free parking and free WiFi. Featuring a fully equipped kitchen in each unit, all guest rooms offer a balcony, air conditioning, a flat-screen TV, coffee machines, an in-room safe, and a telephone. 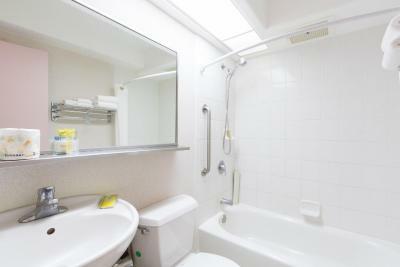 The private bathroom includes a hair dryer, ironing facilities, and a full bath. 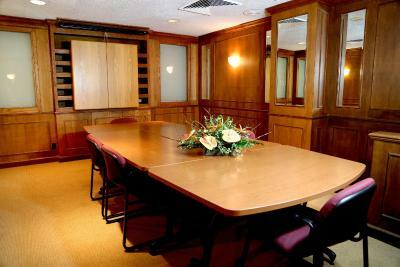 A seating area with a desk and chair is also provided. The Ilima Hotel provides a sundeck, an outdoor pool, a sauna, and a fitness center. 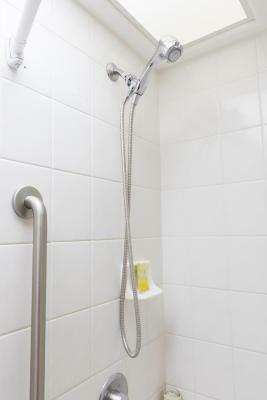 A 24-hour front desk as well as a guest launderette are available for convenience. 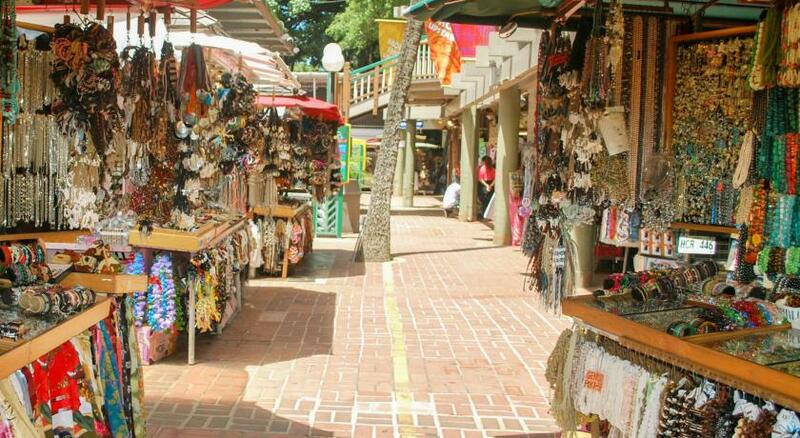 Guests at the IIima can explore the nearby Honolulu Zoo or browse the International Market Place. 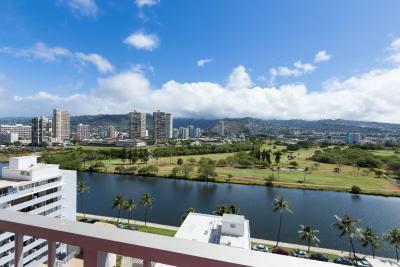 After playing a game of golf, visitors can walk along the Ala Wai Canal. 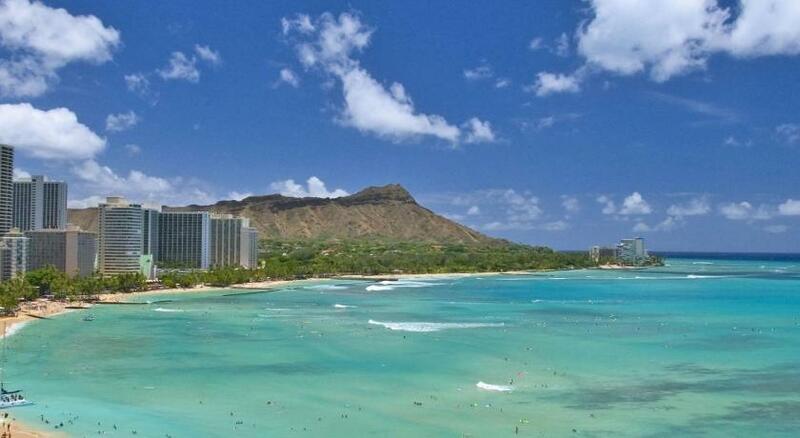 Waikiki is a great choice for travelers interested in beach walks, scenery and sunshine. When would you like to stay at Ilima Hotel? Located on the 10th to 16th floors, this studio is furnished with a full kitchen that includes a microwave, stove-top, refrigerator and a coffee machine. It includes a private patio with either mountain or city views. Smoking units available on request, but not guaranteed. A maximum of 3 guests can stay in this room. This room can accommodate 1 crib/roll-away bed for a fee. Located on the 6th through 9th floors, this studio is furnished with a full kitchen that includes a microwave, a stove-top, a refrigerator and a coffee machine. It includes a private patio with city views. Located on the 4th and 5th floors, this studio is furnished with a full kitchen that includes a microwave, a stove-top, a refrigerator and a coffee machine. It includes a private patio with city views. A maximum of 3 guests can stay in this room. Located on the 4th to 9th floors, this spacious suite features a fully-equipped kitchen that includes a microwave, a stove-top, a refrigerator and a coffee machine. It offers a separate seating area with a wall bed. A furnished balcony with city view is included. Please note: Smoking units available on request, but not guaranteed. A maximum of 6 guests can stay in this room. Please note: Smoking units available on request, but not guaranteed. A maximum of 2 guests can stay in this room. Hotel surroundings – This neighborhood is a great choice for travelers interested in beach walks, scenery and sunshine – Check location Great location - show map Guests loved walking around the neighborhood! House Rules Ilima Hotel takes special requests – add in the next step! Other Ilima Hotel accepts these cards and reserves the right to temporarily hold an amount prior to arrival. Ilima Hotel accepts these cards and reserves the right to temporarily hold an amount prior to arrival. For group bookings of 3 rooms or more, please contact the property. Please note the property will be undergoing renovation from 15 April 2019 to 30 June 2019. The property will be painting and repairing the exterior of the building and room lanais (balconies). Renovation work will be conducted during business hours on weekdays. All effort will be made to minimize noise and disturbance. The property will be undergoing renovations from Mon, Apr 15, 2019 until Sun, Jun 30, 2019. During this period, guests may experience some noise or light disturbances, and some hotel facilities and services may not be available. The room decor and furniture was very dated. It appeared to be built in the 60s and had very little attention since. When our room was cleaned, it wasn't necessarily clean. If there was sand on the floor by the bed one day (hard to avoid when walking back from the beach), it was there the next... unless we arranged our stuff and sort of pushed the sand in the area into a visible enough pile that they'd see and deal with it. Other hotels we've stayed at typically vacuum as a matter of course, not just spot-check. The bedroom is spacious but the bathroom need some change for the curtains and support. Is too old. We are closed. To the beach and restaurant. Didn’t like the all night bar located on the street, lots of noise all night long. Parking was a bonus in a very busy city. Balcony was nice. The staff very helpful. The room big and comfortable. The kitchen is a bonus. Location fantastic and the free parking. Nice location, good service and easy check-in. Free parking. Everything was as expected from an older hotel. Free parking is great. That is very hard to find now days. It can be noisy in the morning with the delivery trucks in the street below. If you don't like 70s architecture, this may not be for you. It's a little dated, yet very spacious.